A friendly staff, good food, and relaxed mountain setting makes this an absolutely pleasurable dining experience! Seriously… in Virginia Wine country located in the tiny mountain town of Flint Hill is an amazing British style tavern! Griffin Tavern is a delightful surprise conveniently located along the Blue Ridge Whiskey Wine Loop as a perfect lunch or dinner location. Try the fish and chips if you have trouble choosing from the impressive menu. The large pub offers a wide variety of ale, wine, and other beverages. Griffin Tavern is a casual dining restaurant with three cozy dining rooms, a “cheers” style bar where friends and strangers mix and mingle and a wonderful outdoor area for seasonal dining. The outdoor dining areas are dog friendly (leashed). They also have rooms upstairs that are perfect for private dining, small functions, and business meetings. 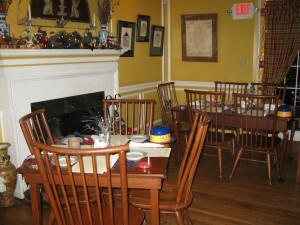 Griffin Tavern is an internet friendly restaurant and pub with WiFi access. The menu features home-style cooked meals and pub favorites using fresh ingredients and local products: Fish n’ Chips, Tavern Wings, Shepherds Pie, Great Hamburgers, Seafood and Steak specials, as well as affordable appetizers, salads, and a Children’s Menu. They are also are able to accommodate guests who are gluten-intolerant with gluten-free pizza and sandwich bread options. Save room for Mary Frances’s homemade desserts like lemon meringue pie, chocolate pie , German chocolate cake and carrot cake. first Monday of the month. Sunday Brunch once a month we will have local musicians. For Upcoming Events: Go here! 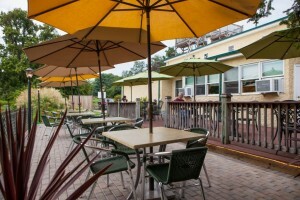 See our our Facebook page https://www.facebook.com/GriffinTavern for daily specials. The friendly staff is anxious to serve you and make any occasion special for you, your family, friends, business or social gathering. Please call ahead for parties of 6 or more for reservations or make them on line with Open Table on their website.